Think Europeans are more into data privacy than Americans? Think again. For all the talk of a trade war breaking out between the U.S. and European Union over online privacy, it may well be that consumers in the two markets have pretty similar expectations regarding what happens with their personal data. Are you aware that your personal data is being collected by internet services? Average response: 75 percent “yes”. Do you believe internet companies are honest about how they exploit your personal data from tracking? Average response: 14 percent “yes”. How true do you believe the following statement is? “Many internet companies are reliant on selling your personal data to advertisers in order to survive.” An average of 46 percent said this was “definitely true” or “true for most companies”. Would you select a do-not-track [DNT] feature if it was easily available, when using a search engine? Average response: 68 percent “yes”. That last question is the kicker, and we’ll get to the implications in a moment. But first, I asked Ovum analyst Mark Little for a bit more insight into the geographical breakdown of his results. Eighty-one percent of French respondents apparently said they would implement DNT, versus that global average of 68 percent. 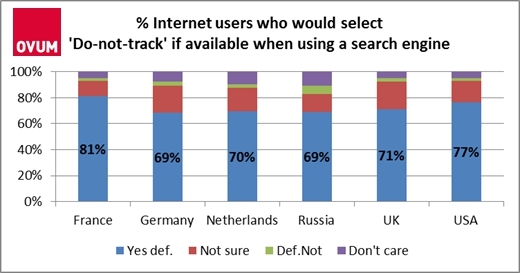 But Americans were actually pretty close behind, at around 77 percent — that makes them five percentage points more likely to block web-tracking technologies than their British counterparts. As Little put it regarding the overall impression he gained from the privacy-related questions, “if you took the average of the European countries, it’s probably pretty close to America”. Little contrasts what he terms “data-fracking” – a loaded term for sure – with “data-friending”. By this Little meant services such as Personal, which lets users store personal data in a privately-controlled container, then share it with other services in a granular and deliberate way. I can’t say I’ve seen such services take off in a big way yet, but Little seems to see big uptake down the line if web services don’t become more “opt-in” in the way they track and exploit their users. Of course, the reason the likes of Google(s goog) and Facebook(s fb) aren’t too keen on this approach is that they want to harvest as much data as possible. And there again, Little thinks the companies are missing out. Why? Because of the quality of their fracked data. In my analysis, that flies in the face of the big data trend, which is all about increasingly educated guesswork, at least in its predictive sense. But if he’s right, and enough people lose patience with being stalked online by advertisers to the extent that they block them and mess up the resulting datasets, then it would be the logical way forward. Interesting that fewer Russians say they would enable it, and more of them say they don’t care… Given their history of surveillance, that seems counterintuitive. Or maybe they have bigger problems to worry about? What is the basis for such an assertion? If the DNT notification was placed in a conspicuous location, there is no reason to think people wouldn’t do as they say. It’s a basic principle of “would you?” questions in surveys, and one that the analyst here himself brought up.